Men and women are built differently which is offset by clubs and courses designed to normalize many of those differences. Though most of the same principles apply to men and women learning golf, fundamental differences exist between a men's and women's golf swing. Because men generate more clubhead speed and are taller and stronger, it is essential that men and women buy equipment suited for their gender, as the equipment is designed to make the most of the key differences in swing styles and speed. In particular, women's golf clubs are usually shorter, have lighter more flexible shafts and grips are smaller. Women have a slower swing speed than men, meaning that they generate less power during a swing. 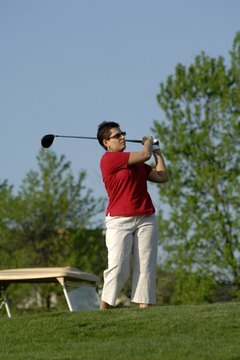 According to LearnAboutGolf.com, the average woman has a driver swing speed of 60 mph or less. The average man has a driver swing speed of 75 mph or higher. To compensate for this, club manufacturers make shafts of different materials and in different flexes. To accommodate the lower swing speed, women's shafts are usually made of graphite or carbon fiber, which is lighter than steel. Most women use shafts designed with lots of flex, referred to as "ladies" and designated with an "L" on the flex scale. Women with a faster than average clubhead speed can try "senior" flex clubs, which are designated an "A." According to LPGA player and teaching pro Debbie Steinbach on LadiesGolfJourney.com, women traditionally have wider hips than men, which translates into a more dramatic weight shift during a swing. Because of this, women may benefit from a wider-than-normal stance. Traditionally, a golfer's feet should be shoulder-width apart at address. But because women have a lower center of gravity, they can benefit from a wider stance. Women have a bigger hip turn and create more resistance during their swing. One of the side effects of a slower clubhead speed is that women tend to have a more shallow angle on the ball at contact. Men usually come through their swings more quickly and at a steeper angle. While this creates the opportunity for a man to take a larger divot, men have the shoulder and wrist strength to compensate for digging into the ground. Women do not have the same luxury, and because of the shallow angle, may struggle to lift the ball off the ground. Club makers build more loft into women's clubs to compensate for this difference, and women's clubs may also have a wider sole and higher degree of bounce. A higher degree of bounce helps the club glide across the ground rather than dig into it, according to LearnAboutGolf.com. Ladies Golf Journey: Venus Takes a Stance on Your Golf Swing!